We touched down Kansai International Airport in Osaka at 8 am local time. We were given some time to freshen up before we met our Japanese tour guide (a Taiwan born man who has been in Japan for 20 years) and boarded a bus heading Nara. Nara is about 45 minutes away from the airport. Nara (奈良) is a small but organized town. 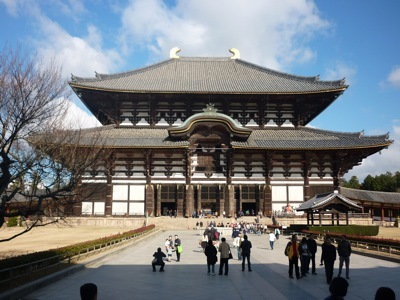 In Nara, an ancient capital of Japan even older than Kyoto, we visited Todaiji Temple and its surrounding Nara Park. 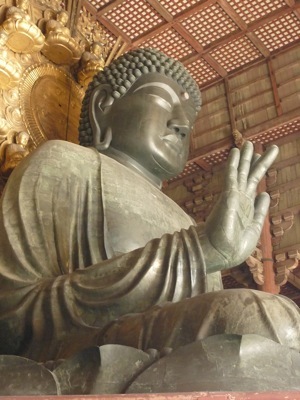 Todaiji Temple is home to Japan’s largest bronze Buddha which is located in a wooden structure. It was first built around 700s. Visitors are welcomed by thousands of free roaming deer at the entrance. It is said there are 1200 deer in Nara Park. 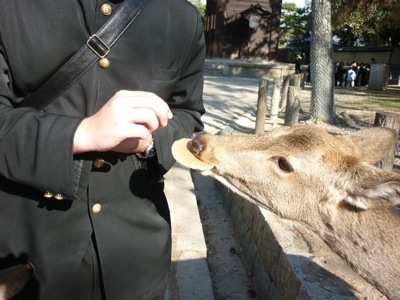 You can buy deer cookies around the park but beware that the deer tend to be very aggressive if they find food in your hand. They will follow you (a herd of them!) and grab the food from you if it is within their reach. Visiting the temple is a systematic affair. You will be guided by signage to enter on the left side of the temple and come out on the right. Thus it is a circle around the temple. This is also true when you are in the temple itself – it gives you a 360° view of the Great Buddha. 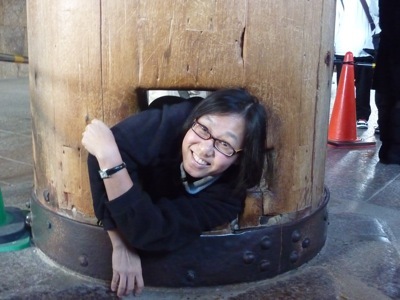 One interesting feature of Todaiji is, in one of the big wooden column lies a small hole slightly above the ground. It is believed that you are sure to reach enlightenment (or do well in school) if you manage to crawl through this opening. I dared not try as my waistline was not favorable to me in this attempt. However, my wife went through the hole successfully. Todaiji admission fee: ¥500 adults, ¥300 children. Later we walked through Nara Park heading to a nearby restaurant for lunch. The food was nice and it was more than what I used to have back home.